Australia was built on the sheep’s back. At least, that’s what we were all taught at school. We even sang pseudo national anthems like ‘Click go the shears, boys, click, click, click’- outdated of course as, ever since power was introduced to the shearing sheds, it would’ve been more like ‘buzz, buzz, buzz’. That was sound that you would’ve heard back in 1955 when wool prices reached a record high. It was a seriously buzzy time but it didn’t last for long. The following year came a massive slump which graziers tried to ameliorate by slashing shearers’ wages. It was a real slap in the face to all those hard working men who busted their guts in the sweltering heat under corrugated iron roofs. An in response, the call went out across the country to strike. 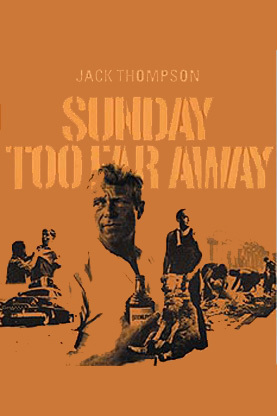 Sunday Too Far Away documents this momentous strike through the very personal story of gun shearer Foley (a very spunky Jack Thompson)who joins a team of seven men wrangled together by novice contractor Tim King (Max Cullen) to work on ‘Timberoo’ station near Quorn. Mateship is the key to survival in this game and Foley is everyman’s best buddy but his dominance in the shed is threatened by outsider Arthur Black (Peter Cummins) and the arrival of a train load of ‘scabs’ hired on to do the job for a reduced wage.